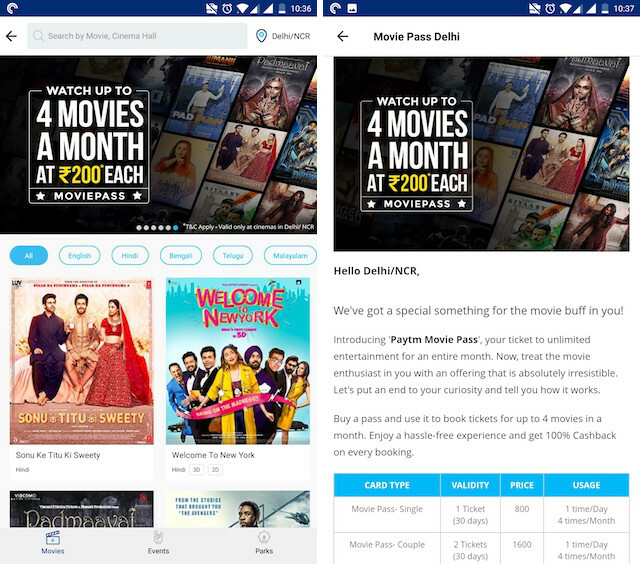 Paytm has just launched a new offer for all the moviegoers with a new service called “Movie Pass”. With Movie Pass, one can watch up to 4 movies per month at just Rs. 100 each in select regions. To avail this offer, you have to buy a Movie Pass from Paytm after which you will receive a unique code via SMS/email. And the next time you buy a movie ticket, you can add the code to avail the 100% cashback on the price of the movie ticket, essentially making the movie free. But there are a few caveats, that rob the sheen off this offer. Movie Pass can only be used for one movie per day or four movies per month. The price of movie pass depends on the city that you live in. In Delhi, for example, the Movie Pass will is priced at Rs 800 for individuals and Rs. 1600 for couple pass essentially making it Rs. 200 per movie. On the other hand, the price is Rs. 150 per movie in Pune, and Rs. 100 per movie in Ahmedabad. So, check the offer in your location to see what the Movie Pass is going to cost you. Movie Pass is not valid on Director’s Cut, Gold Class Cinemas & IMAX Screens. The cashback will be credited to your Paytm wallet within 48 hours of booking movie tickets. If I understand this point correctly, it renders the movie pass useless. If my total cashback cannot be more than the value of Movie Pass, I am essentially paying for the overage. However, it might be possible that I am understanding this incorrectly, that’s why we have sent an inquiry to Paytm and will update the article as soon as we hear from them. The best part of Movie Pass is that you need not be alone to use it; you can buy a couple pass which allows you to buy two tickets for each of the four movies per month. 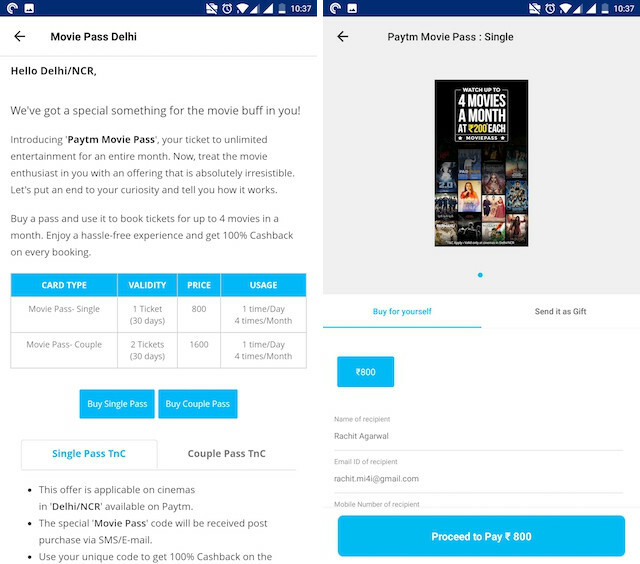 You can buy the Paytm Movie Pass by either visiting the movies section in the Paytm app or visiting Paytm’s website.